Rosharon, Texas (Aug. 11)—On Aug. 11, 2014, four female skydivers set a new world record for largest vertical skydiving formation performed in a head-up orientation (also known as sit-flying or feet-first flying) at Skydive Spaceland in Rosharon, Texas, just south of Houston. 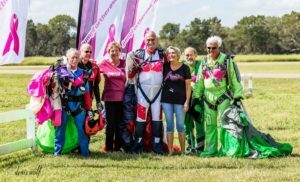 The women achieved the record on their eleventh attempt during the annual Jump for the Rose fundraiser, which benefits The Rose, a nonprofit breast health organization providing screenings and diagnostics. MEDIA NOTE: Several earlier attempts resulted in formations the same size as the claimed record, but as the girls declared a larger formation attempt on those jumps and were unsuccessful at that, those attempts were not certifiable as records. This is to clarify why the “additional” photos/video linked above show formations as big as that in the record photo linked first, but are not considered records.